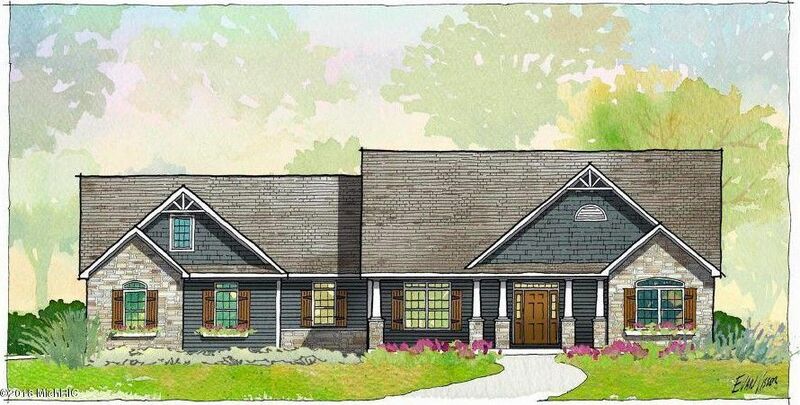 Exciting new design in The Ridge, Cottage style ranch. The craftsman at Summit Development Group will construct your new home in this design with tasteful stone and siding exterior, open floor plan with large great room, breakfast bar to a custom kitchen with solid surface tops, stainless appliances, tray ceiling in the adjacent dining room. Large master bedroom suite and a mini bedroom suite and a 3rd bedroom and bath. Four season room off great room. Den or home office and three car garage round out the main level. Superior wall system in basement for an easy to finish basement. Optional bonus room over garage Call or text Joy at 269-209-0399 to set up time to meet with builder to review options. Directions: Stone Jug road then west on Ridgeview left on Waldon right on Cedar Creek.